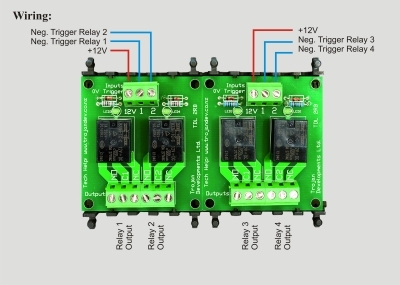 The 4 Way 8 Amp Relay Board has 4 x 12Vdc negative trigger inputs that switch 4 x 8 amp single pole double throw relays. Each set of two relays can be switched from different power supplies and if only two relays are required, the board can be split into two. If this is not required the inputs will need to be linked together. The board also fits the TDL Mounting Base system, which makes installation very easy and tidy as it allows all cables to be run behind the PCB and covered by a cover that also has an area for labelling. They can be connected together with other boards to make up a complete system of relays, fuses, timers etc… The TDL Mounting Base also comes complete with fixing tape and screws.